Protein turnover measurement at sub-cellular level with CAMECA NanoSIMS. In this study, the NanoSIMS is used to quantitatively measure a slow protein turnover at subcellular level inside the cochlea of bullfrogs and mice using a stable isotope labeling strategy. Adult bullfrogs were fed 15N-leucine food 1/day and sacrificed at 1, 2, 4, 8, 16, 22, 32 days. Inner ears were dissected out, chemically fixed, embedded in resin and microtomed. The NanoSIMS ion microprobe offers unique capabilities of isotopic measurement and imaging down to 50nm lateral resolution, which, combined with an isotopic (or elemental) labeling strategy, allow biologists to view and quantify turnovers and to follow the fate of biomolecules with intra-cellular resolution. 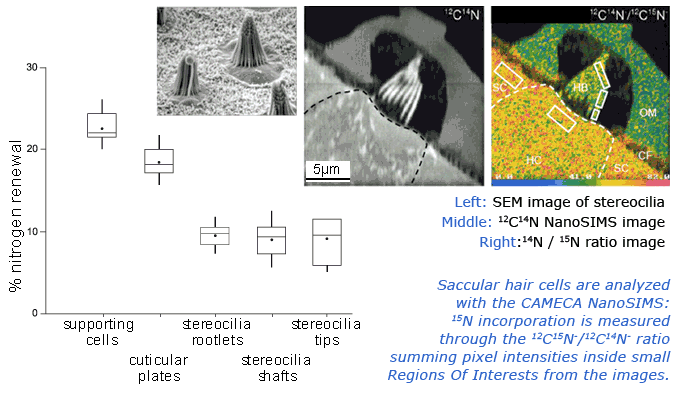 Movement and Growth of Hair-Cell Stereocilia: Presentation by David P. Corey, Howard Hughes Medical Institute & Harvard Medical School during the "Molecular Cell Dynamics" conference, June 1, 2007 at the Institute of Neuro and Behavioural Biology, University of Muenster, Germany.